Metal roofing has been around for many years and has a lot of great qualities. Durability and longevity are what I believe to be the most notable. Metal roofing can have a life span of 50+ years. I say “can” because the installation and maintenance affect longevity. When not installed incorrectly, I have seen them need to be replaced in 10 years. In this article we will be discussing the methodology of re-roofing over low sloped structural metal panels using single ply membranes. Below is a description of low sloped metal roof systems and their characteristics from the NRCA (National Roofing Contractors Association) taken from their website, Everyone Needs a Roof. 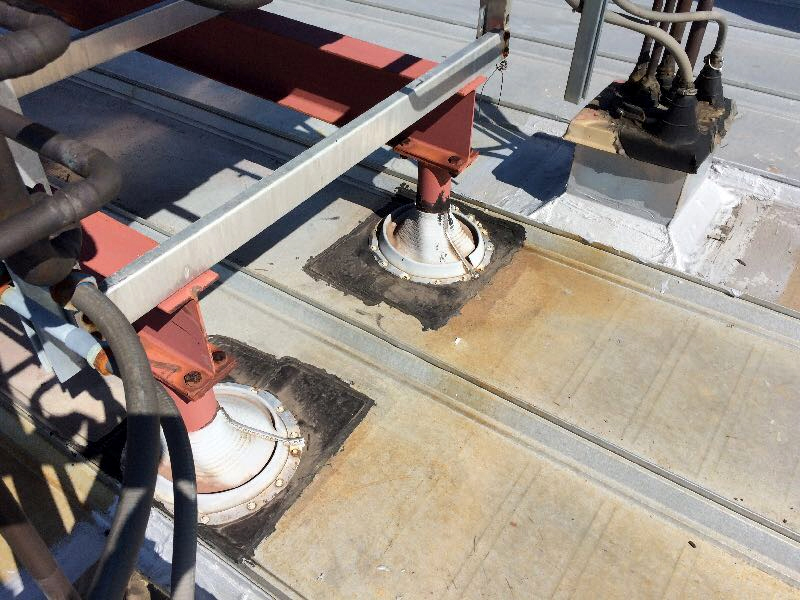 The photos below are from a roof inspection that was performed for a building acquisition. The roof was said to be approximately 10 years old, which I found hard to believe when I reviewed it. Improper repairs completed at the stanchions and small curbs. Photo shows 10 year old roof with repairs completed to the built-in gutter, wall flashing and the edge of the panels into the gutter. We were informed that the roof system had leaks and other issues practically from day one. Excessive repairs were located throughout the roof system. The built-in gutter, wall flashings and the field of the roof had all been modified in ways a 10 year old roof shouldn’t need to be. 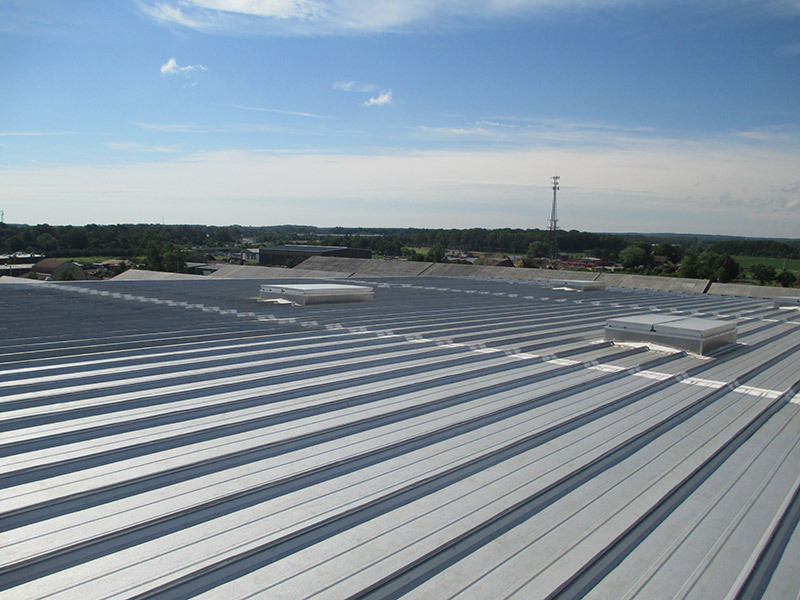 Many of the older structural metal roof systems have roof panels that appear to be in fair condition but as you can see in the photos above, most of the time the problems lie in the details of the roof system. 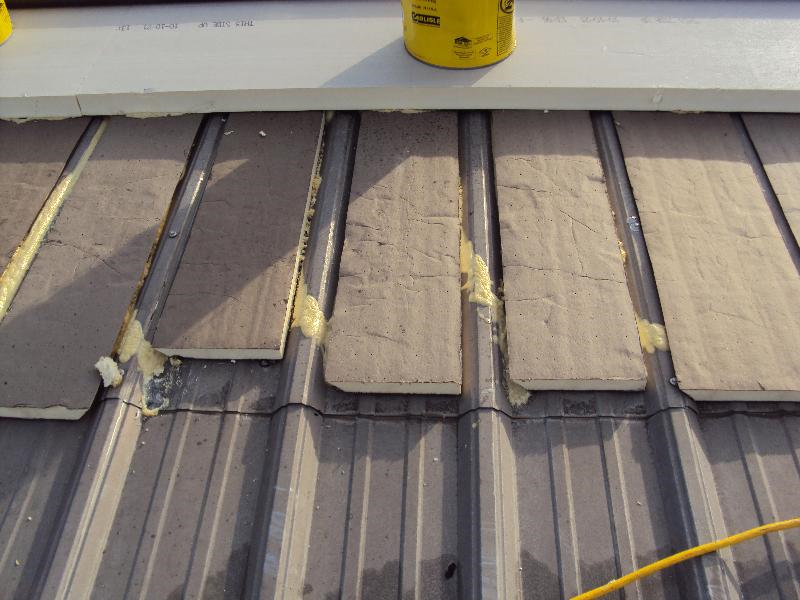 Roof top penetrations, wall flashings, gutters and drain flashings are the most likely areas to have deficiencies followed by the seams in the field. Yes the panels may last 50+ years but in most cases the flashings may not. These are the areas where craftsmanship will make or break a roof system. 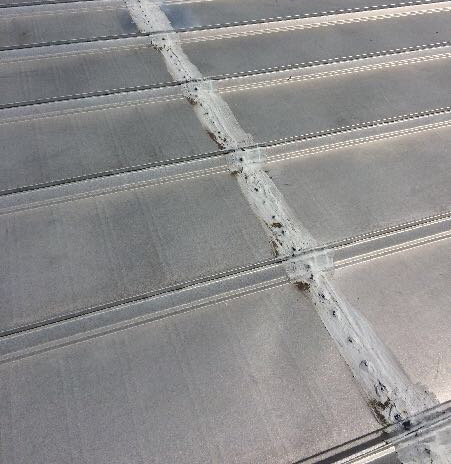 Severe oxidation issues leading to holes or panel deterioration are normally the only reason a panel wouldn’t last. It has been my experience that a metal roof in this condition isn’t worth the cost to repair. The time to undo the old repair, material for the new repair and the labor, all add up quickly. At the end of the day, you still have a patch on bad craftsmanship. So what is the alternative? 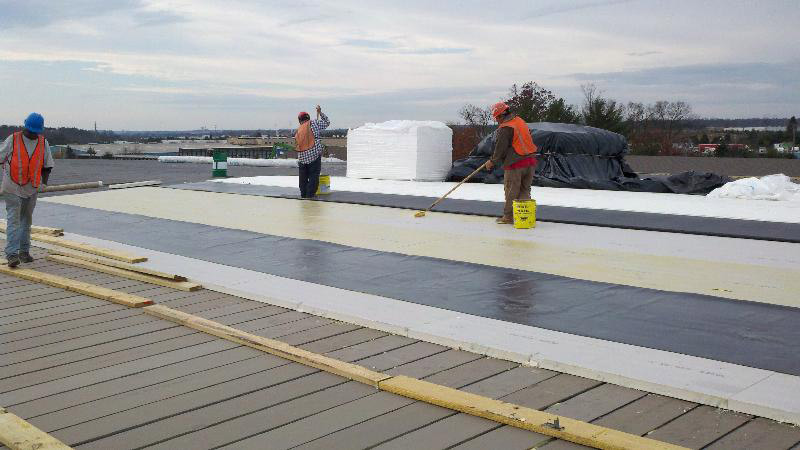 This is where a single ply membrane retrofit roof system comes into place. Single ply roofing over a metal roof, also called single ply retro fit, can be completed with TPO, PVC or EPDM. In some cases, another metal roof can be installed over and existing one. For the purposes of this article we will only be discussing single ply retro fits. Here is a brief overview of how the retrofit system might be installed. 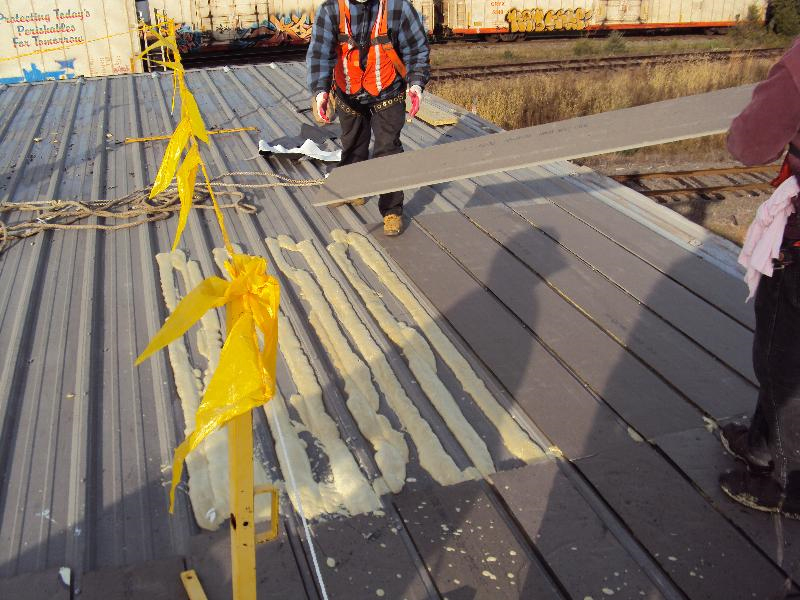 Below are photos of a metal retrofit system being installed using spray foam adhesive. It all starts with an examination of the under deck. 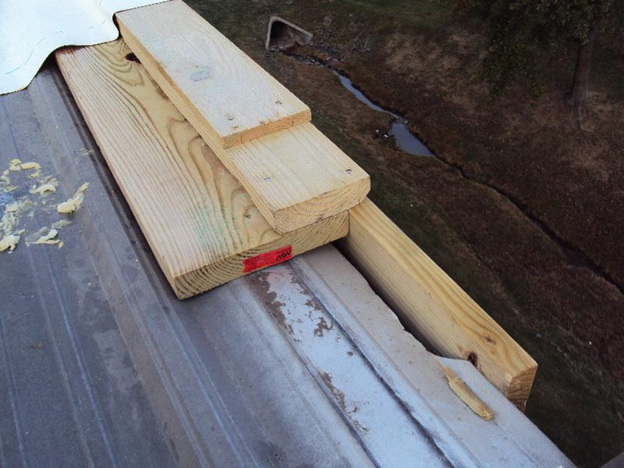 How much damage has occurred at the substrate or the purlins and can the building support another roof system. Usually, if the decision is made in time, the new roof can be installed. In most cases the damages are minimal and can be repaired. Next is the installation of wood blocking at all of the edges of the roof to create a new wood nailer needed to match the height of the new insulation. Most of the time this requires the removal of the existing gutter and current metal edge terminations. This photo shows the rake edge where the existing metal has been removed and new wood blocking has been installed to create the proper termination point for the new metal edge. Next is the insulation. Mechanical fasteners or adhesives can be used to attach the layers of insulation. The first layer of insulation is used as a filler between the standing seams and sit flush with the top surface of the seams. The second layer of insulation is then placed over the first layer to create a solid substrate for the membrane installation. Installation of the flute filler. 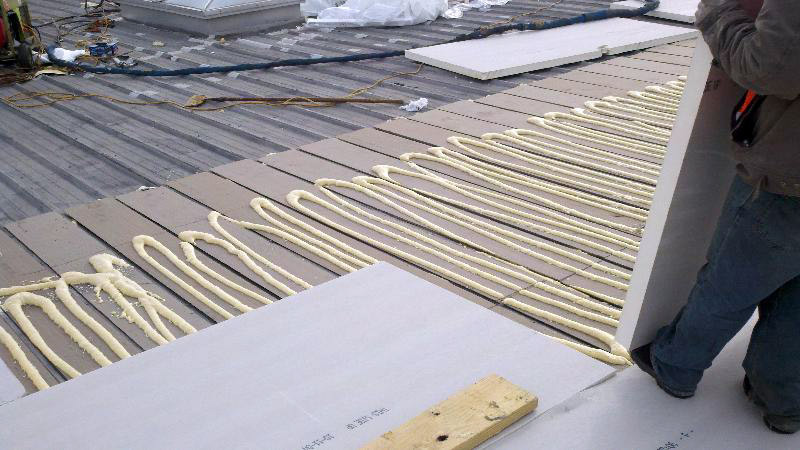 This photo shows flute filler and insulation substrate installed. Second layer of insulation being installed to create flush surface for membrane. For the mechanically fastened option, strips of membrane are attached to the structural purlins according to the manufacturer’s requirements utilizing purlin fasteners and plates and spaced depending on the projects wind zone and uplift requirements. 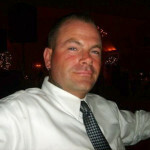 The membrane is then secured to the fastened strips of membrane using special glues or tapes. 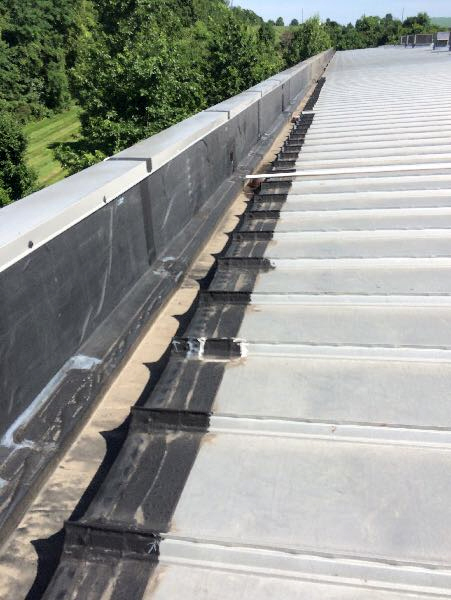 When installing a TPO or PVC plated bonded system then fasteners can also be used in the field of the roof and are attached underneath to a plate. Finally, the membrane can be installed. This can also be accomplished by either adhering or mechanical fastening. Just as the layers of insulation would. This is the brief version so I skipped a few of the details. Roof systems should be installed according to manufacturer’s requirements. 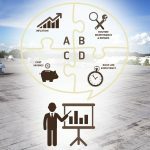 There are multiple options available when it comes time to replace your metal roof system, whether you elect for another metal roof system or want to go the route of a metal roof retrofit. Make sure you hire a professional to first evaluate the system to ensure a retrofit is the right solution for you. Our highly trained technicians can evaluate your existing roof system and give you the best options for your building and budget. Contact us today!